Laurence Rosenthal’s fruitful cinematic collaboration with director Peter Glenville began with the Oscar-nominated score for Becket (1964), and continued with the two films featured in this 2CD set: Hotel Paradiso (1966) and The Comedians (1967). Hotel Paradiso, based on a nineteenth-century French farce, starred Alec Guinness and Gina Lollobrigida as Parisian neighbors. Their attempt to have an affair lands them in a disreputable establishment where incompetence and confusion reign supreme. The comical comings and goings of the cast are supported by Rosenthal’s light-hearted, delightful score—written for a chamber orchestra of 15 players. His airy musical confections are entirely appropriate to the farcical plot. Rosenthal’s next effort for Glenville involved an entirely different type of film. Graham Greene’s script for The Comedians, based on his own novel, chronicled the intermingled stories of several foreigners caught up in the crumbling, festering world of Haiti under the rule of François “Papa Doc” Duvalier and his brutal secret police. It boasted a stellar cast—headlined by Richard Burton and Elizabeth Taylor—that included Peter Ustinov, Alec Guinness and James Earl Jones. Rosenthal’s main theme reflects the film’s story—about the gulf between surfaces and the underlying realities they mask—with a spirited Latin American dance (featuring native percussion) laid over a jarring bed of dissonance. The turbulent relationship between Taylor and Burton’s characters is captured in an uneasy and unresolved love theme. Throughout, the music is dark, subtle, sophisticated—and ultimately as enigmatic as Greene’s disturbing novel. 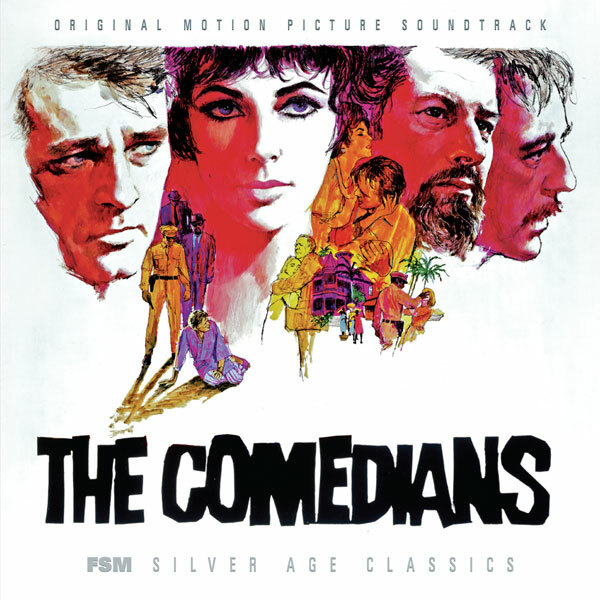 FSM’s definitive presentation of Laurence Rosenthal’s scores for Hotel Paradiso and The Comedians includes the MGM Records stereo album sequences for both films on disc one, and the expanded score of The Comedians (also in stereo) on disc two. Of the two scores (both recorded in London), only the latter survives in complete form. John Takis based his insightful liner notes on extensive interviews with the composer. The 24-page booklet includes a track-by-track commentary on both scores (detailing the numerous differences in The Comedians between the score as written and as used in the film). Film stills, posters and LP jackets comprise the attractive art work selected by Joe Sikoryak. Additional information on the music is available online—here—for free. Awesome! I was just considering buying the Chapter III release last week (and then saw it was too pricey). I've always enjoy the snippets I have from the old Rosenthal double promo. Looks like a great release. Thanks guys! Wow @ what's on disc 2! THE COMEDIANS is an amazing score on its LP presentation-- is the complete score preserved in stereo or mono? Nice update of these two excellent Rosenthal scores. Thanks, FSM! Great scores. Looking forward to both. However, why the price increase? Older, 2-Disc sets, featuring two separate scores were once priced at $24.95. Is it simply the obvious--need more money to "keep the lights on?" if so, that's cool; I'm just curious of the price jump. I've got a promo to kill. Awesome cover. I will have to end up ordering it. Esp at 1,200 copies. Disc 2 is an expanded presentation of the score to The Comedians in full stereo from the original 3-track recording. Looking forward to getting this fine release. Unfortunately, a 2CD FSM set nearly always means a purchase delay thanks to SAE's $5.30 local mailing cost (making this a $35+ purchase!). So FSM ends up waiting on Varese's releases so that a bulk order can make SAE's shipping costs palatable.